I was painfully reminded recently about how quickly our lives could end. Another police officer in Phoenix, Paul Rutherford, was killed doing his job. He was doing what he’s done many, many times before. But this time, his life ended. 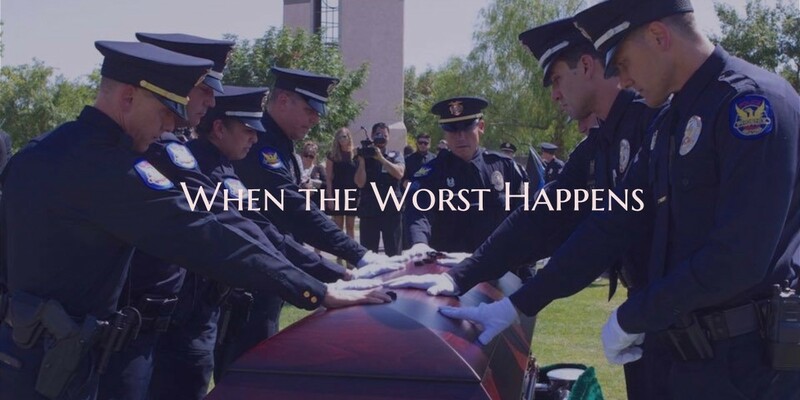 My son, David Glasser, was a Phoenix Police officer who was killed almost 3 years ago. He was doing his job just like he had done every day for 12 years. But on May 18, 2016, his life ended. Those of us who were left behind will never be the same. Our worlds blew up and the emotional fall-out continues. Following Officer Rutherford’s death, I was reminded of all the pain as I looked into the hurting eyes of the ‘framily’ that is taking this tough journey with me. Tears and an unforgettable hole. It’s a struggle. Some of my steps moving forward really hurt. If you’ve been reading this blog, you know that the last thing Davey said to everyone that he cared about was “love you”. He even said it to his squad members and waited until they said it back. It has been such a blessing for us to have that last ‘love you’ echoing through our heads as we deal with the grief and loss of Davey’s death. If you have been reading this blog, you also know that one of the things I wish Davey had done was write me a letter. It would be something I could get out to read over and over again on the dark days when I need some encouragement. Because of this, I have now written letters to everyone who is dear to me in my life and I plan to update them every ten years or so if I stay on this planet for a while longer. I know Davey loved me. He and I thought alike so we didn’t have to say a lot to communicate how we felt about each other. Now, I would really love to have some of that written down in a letter. He had written what he thought his life would be like “40 years from now”. He gave a couple of options of what he wanted as a career and one of them was ‘police officer’. He described the woman he would marry, how many kids he wanted, and his desire to continue to grow his relationship with God and be active in a church family. It’s amazing to me that I kept this. It’s definitely a God-thing. I’m an anti-hoarder so I’m very selective of the things I choose to keep and the number of old things I’m willing to move and store goes down as the years progress. I shared the list with my husband and Kristen because this is as close to a letter as we’re going to get. I have discovered that this list encourages me. It reminds me of Davey and sparks great memories of how his eyes would light up when he talked about his plans and dreams. He didn’t have 40 more years. But reading this list makes me so grateful that we took full advantage of the 16 more years he had at the point when he wrote this. No regrets. We had 34 awesome years with him here on earth and that’s going to have to be enough until we see him again in heaven. Thank you for the letter, Davey. Every time another officer is killed in the line of duty; I say a prayer to GOD to comfort you ~ as your grief never will totally leave you. May you always focus on the fact that Davey lived his life LOVING YOU and he will always be watching over you. You have him in your hearts carrying his love with you every moment of every day. Those letters are so important and I’m glad you have that special letter from Davey to pull out and read when ever you feel that need. Love you and I always love reading your Blog Judy.